Located on Seattle's waterfront, the Aquarium provides a window through which to see amazing sea creatures and colourful coral life of the Pacific. The aquarium contains exhibits such as touch pools with animals like sea stars and urchins from Puget Sound and Washington's outer coast. The Window on Washington Waters is a huge exhibit filled with native marine life, where dive shows take place three times daily, while the Marine Mammal exhibit features sea otters and seals viewed from both above and below the water. The Underwater Dome is one of the largest exhibits, an undersea room that provides 360 degree views of the fish and sharks as they swim. Some further exhibits available at the aquarium are Ocean Oddities, Life of a Drifter, Pacific Coral Reef, Marine Mammals, Orca Activity Center, Searching for Sixgills, and more. 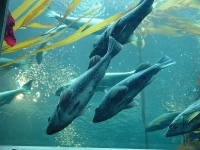 The aquarium hosts events on a regular basis, some of which include a Celebrate Sharks event, the Naturalist Program, parts of the Seattle Science Festival, and more. Conservation is a big focus at the aquarium, and the attendants and guides take care to educate visitors about marine conservation. The aquarium is in a part of Seattle that's full of very good restaurants, so making a day trip out of a visit to the aquarium is a good idea. Opening times: Daily 9.30am-5pm, exhibits close at 6pm. Admission: $30 adults, $20 children 4-12, free for children 3 and under. Additional fees for Argosy Harbor Cruise.